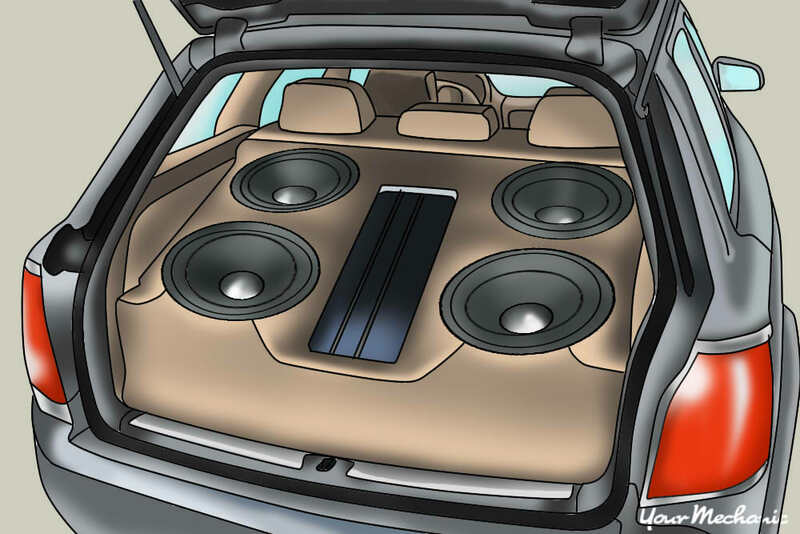 While a factory sound system will do the job, if you want to really “feel” the music, you should install an aftermarket system, and subwoofers are a big part of a high quality aftermarket car stereo system. 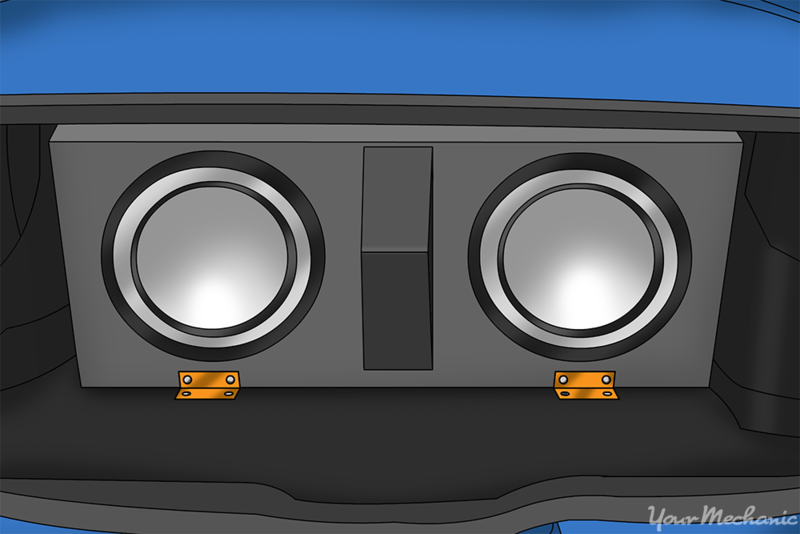 Subwoofers are one of the best upgrades that you can do to any stereo system. Whether you are looking to even out the mid-range sound with some smaller diameter speakers, or set off the neighbor’s car alarm with a trunk full of 15-inch subwoofers, the installation is essentially the same. The only function of a subwoofer is to reproduce low frequencies, more commonly referred to as bass. 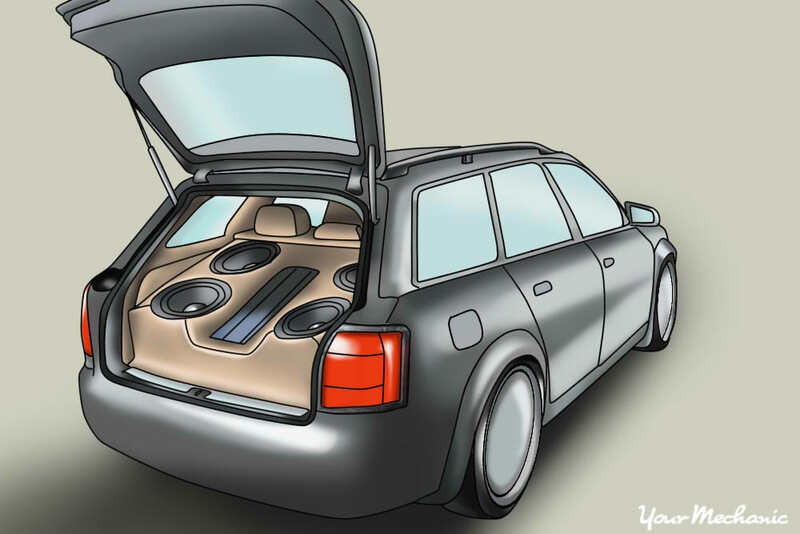 Regardless of the type of music you love to play, a quality subwoofer will improve the sound of your car stereo. Factory installed stereos usually include a subwoofer, but they are often too small to produce very low frequency sounds. A high quality subwoofer can solve this problem. Subwoofers are available in a number of different sizes and types. 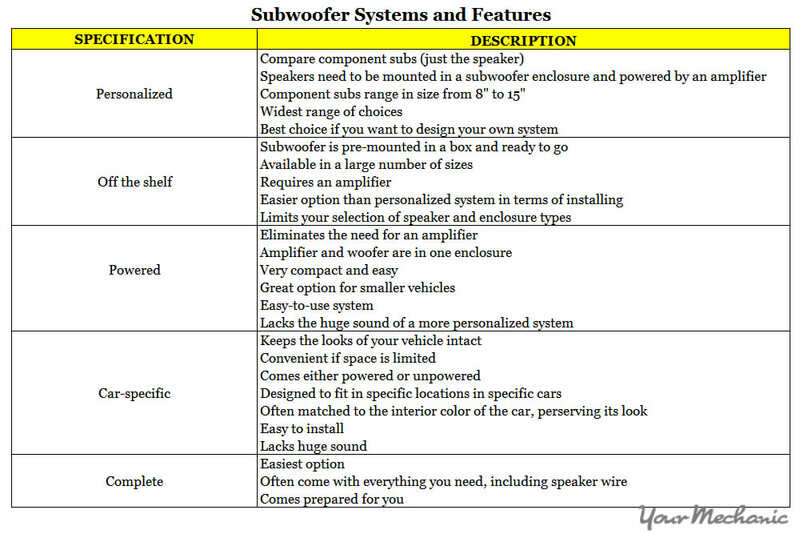 There are many factors to consider when choosing a subwoofer, including your musical tastes, the amount of space in your vehicle, and your budget. Let’s have a look at the various types of subwoofers available and how to choose the right one for your vehicle. 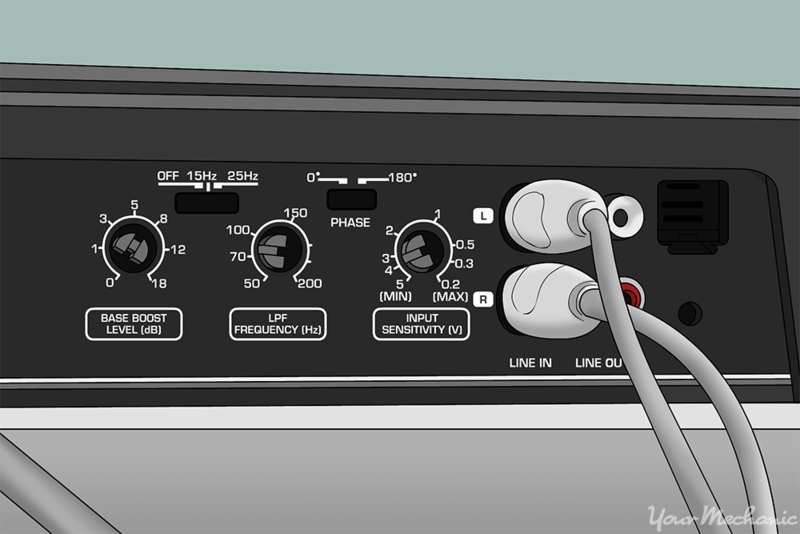 Step 2: Compare speaker specifications. 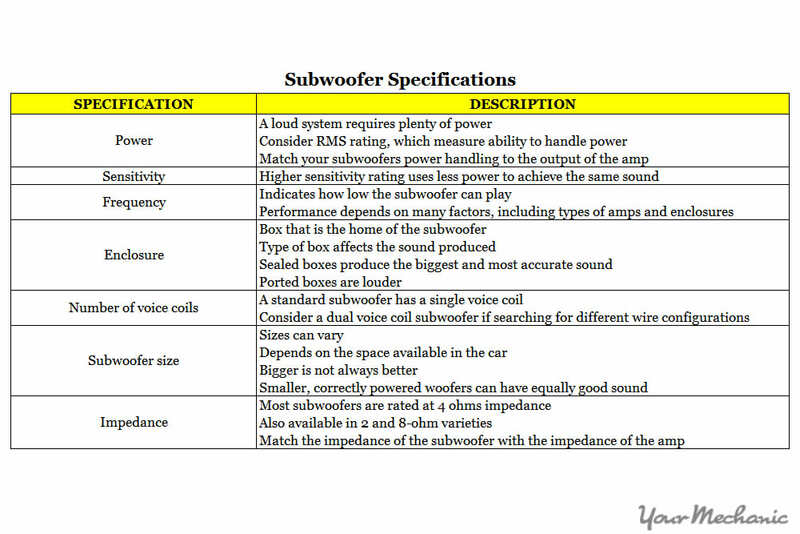 There are many specifications to consider when choosing subwoofers. Note: The dynamat kit helps prevent rattling while the polyester fiber is a stuffing that goes in the enclosure. Step 4: Do your research. Once you have decided on the type of system you want to put in your vehicle, it is time to do some research. Ask friends and family for recommendations, read reviews, and determine the best components for your vehicle and budget. 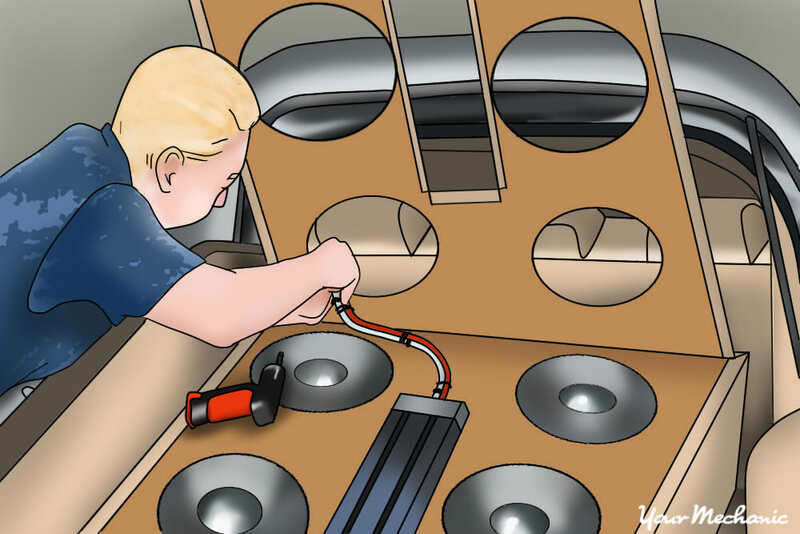 Step 5: Determine where the subwoofer will fit.You should also determine where you plan to put the subwoofer in the vehicle and take measurements to ensure that the components you choose will fit properly in the car. Step 6: Purchase the system. It’s time to break out the credit card or checkbook and start buying the components of your system. Subwoofers and the other necessary components can be purchased at variety of outlets. When you have found the best price, purchase your new car stereo system. Step 1: Determine where the subwoofer box and amplifier will be located. Typically the trunk is the most common choice to place these items, so we’ll base the following instructions on that. Step 2: Mount the amplifier and speaker box to something solid. This is imperative, because you don’t want these items sliding around the vehicle when traveling over bumps and around corners. Most stereo system installers will mount the speaker box directly to the floor with some long bolts and nuts. This requires drilling four holes in both the subwoofer box and the floor of the vehicle. Warning: Before drilling anything during this project, you must double, triple, and quadruple check the locations of where you expect the holes to be. The bottom side of the car is full of important items like brake lines, fuel lines, exhaust systems, suspension parts, and sometimes differentials. You really don’t want to unexpectedly drill a hole through something important just so you can drop the bass. If you are uncomfortable drilling through the floor, consider one of the expert technicians from YourMechanic to tackle this project for you. Step 3: Install the speaker box with the “L” brackets. Now that you have inspected the underside of the car and located safe places to drill holes in the floor, screw the “L” brackets into the speaker box. Then line up the opposing holes in the bracket to a section of the floor that is safe to drill through. Drop bolts through the “L” bracket, through the floor pan. 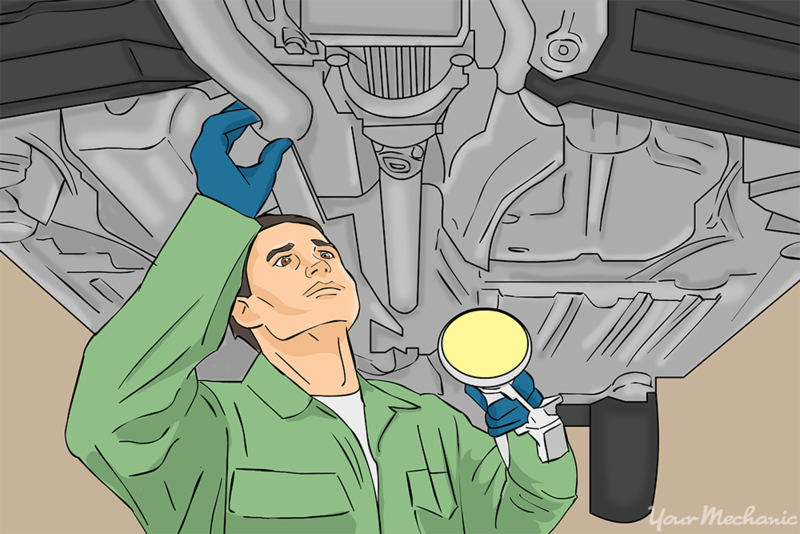 Use a flat washer and secure the bolt with a nut on the bottom of the vehicle. 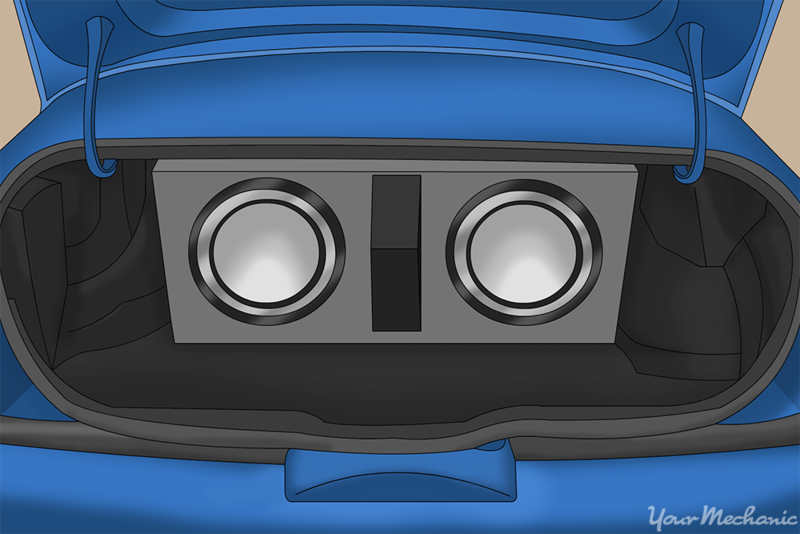 Use four “L” brackets to ensure that the speaker box is firmly mounted to the vehicle. Step 4: Mount the amplifier. Most installers mount the amplifier to the speaker box for ease of installation. Place the amplifier on the speaker box and screw it into the box so that it is securely mounted. Step 5: Remove the stereo head unit from the dashboard. Have the RCA cables and the “remote” wire (also could be labeled as a “power antenna” wire) ready to install. The RCA wires send the music from the stereo to the amplifier. The “remote” wire tells the amplifier to turn on. Run the RCA and remote wires from the stereo head unit through the dash and down to the floor. 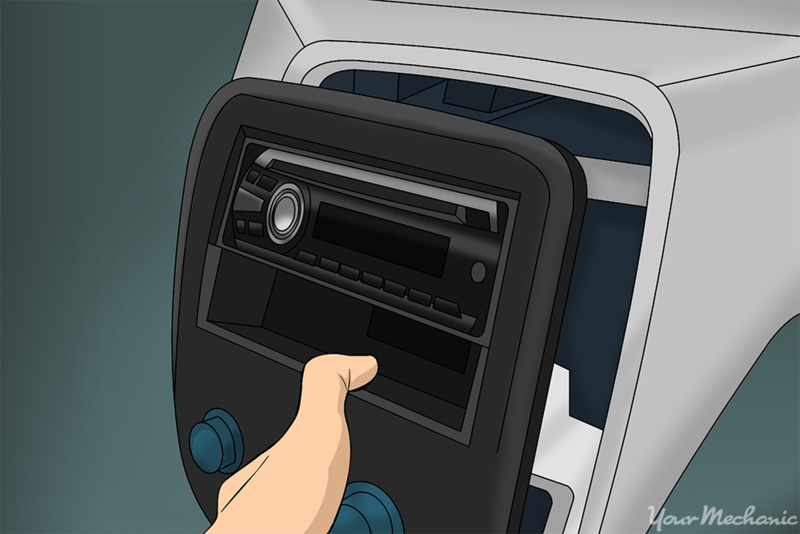 Be sure both wires are connected to the head unit, and then reinstall the head unit back into the dashboard. Step 6: Connect the cables and wires to the speaker box and amplifier. 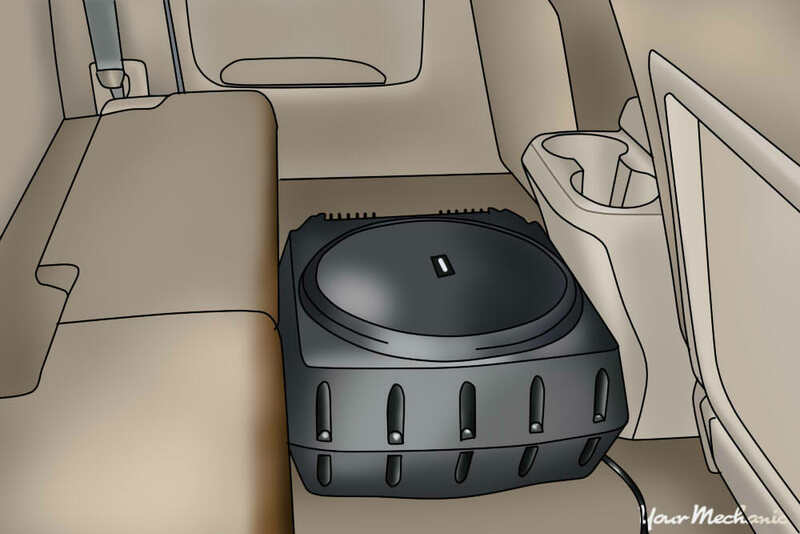 Run the RCA and remote wires under the carpet of the vehicle, all the way back to the speaker box and amplifier. 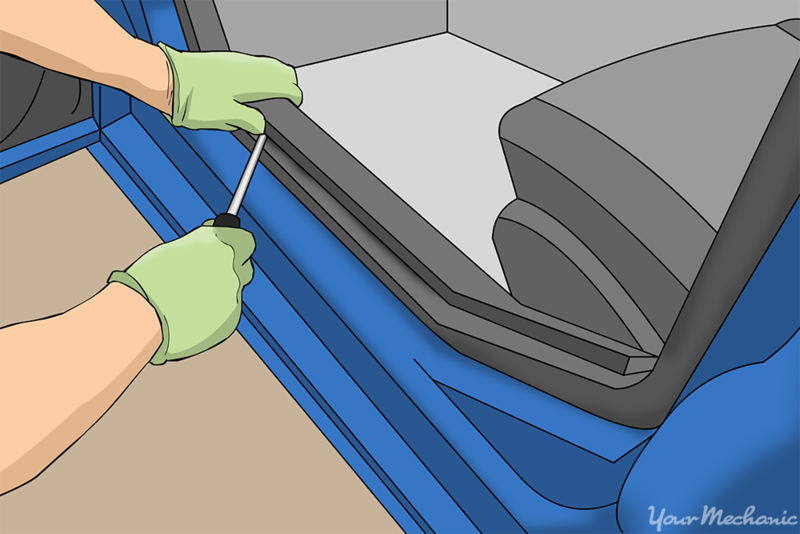 This process will vary between vehicles, but typically there is a kick panel and some interior trim that will need to be removed allowing the wires to sneak under the carpet. Connect the wires to the appropriate terminals on the amplifier - they will be labeled accordingly. Typically a Phillips screwdriver or an allen wrench is used for this, though it will depend on the brand of amplifier. Step 7: Run the power feed wire but do not connect it yet. Run the wire directly from the battery through the firewall into the interior of the vehicle. Be sure to use grommets anywhere where the wire is fed through a piece of metal. You do not want power feed wire chafing on sharp edges. 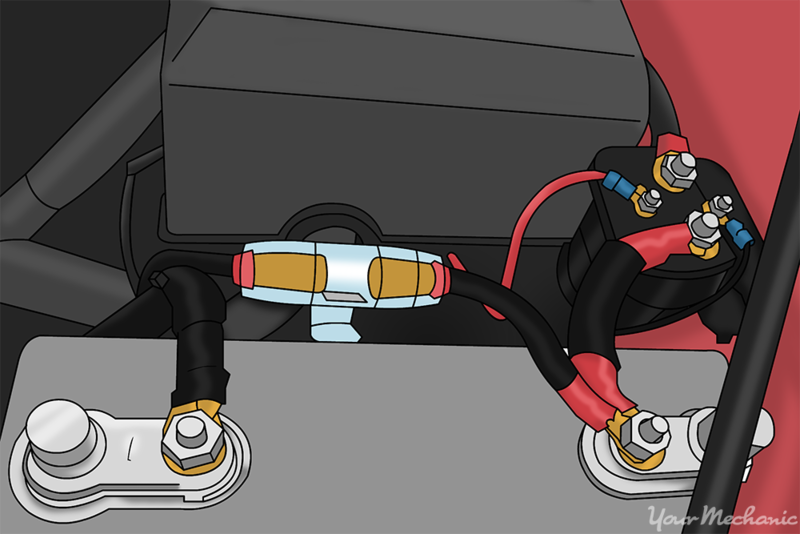 Once inside the vehicle, run the power wire down the opposite side of the vehicle from the RCA and remote wires. Running them next to each other often causes feedback or unpleasant sound coming from the speakers. Get the power wire to the amplifier, and attach it to the large positive terminal. Step 8: Install the buss fuse. The power feed wire needs a safety mechanism, and that safety is a called a “buss fuse”. The amperage of this fuse should be determined by the instructions that are included with the amplifier. This fuse must be installed within 12 inches of the battery; the closer it is to the battery, the better. In the unfortunate event of a short happening, this fuse will pop and cut power to the power wire. Having this fuse is the most important part of this entire installation. Once the fuse is in place, the power feed cable can be connected to the battery. Step 9: Connect the speaker box to the amplifier with the speaker wire. This again will require the use of a Phillips screwdriver or allen wrench. Step 10: Drop the bass. It’s best to have the settings on the amplifier and head unit turned to their minimum settings before cranking the volume. From there, the settings can be slowly increased to the desired listening settings. Your car stereo should now be thumping, and you can enjoy high-quality sound with the satisfaction that comes from performing the upgrade yourself. If you have difficulty with any part of the process outlined above, you can always get help from a professional mechanic or stereo system installer. Installing a subwoofer is an option for drivers who want a better musical experience while on the road. If you get a sound system installed, your car will be wired for great sound, so you can get out on the road and blast your favorite tunes. If your driving experience is being hindered by loud noises coming from your car, preventing you from making the best of your new stereo, let YourMechanic’s certified professionals perform an inspection. Q: I want to change headlight to an adaptive LCD headlight from 2015 BMW 750i. Is it possible?